Storm the dog is being hailed as a hero after rescuing a drowning fawn at Long Beach. Scroll down for the original video of the rescue. A golden retriever leaped into the waters off Long Island during a morning walk over the weekend and, after a furious swim, returned with a drowning fawn in its mouth, its owner says. Owner Mark Freeley said he had been walking Storm along the sand at PJ Harbor after 8 a.m. Sunday when the dog jumped into the water and started swimming after something. Freeley captured video of the pup swimming back to shore, clutching something large in its mouth, and once Storm got close enough to stand, Freeley could see the "something" was a fawn. 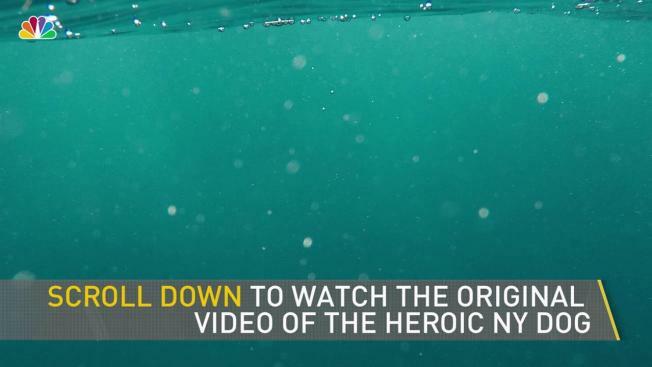 The video shows the heroic Storm toss the deer onto the sand; the deer moves, struggling to stand up, and Storm grabs it in his mouth and bounds up on the rocky shore. He puts the fawn down and tries to revive it with some loving licks and nudging. The deer appeared exhausted but was breathing. According to reports, the man and dog stayed with the deer until a vet showed up. The fawn is expected to fully recover. Meanwhile, Freeley's Facebook post on the beach rescue has gone viral, with more than 1.2 million views and 30,000-plus shares in 24 hours.